That's my room. This is where i sit and type most of my blog-posts. My under-wears are on the floor and one of my socks is on the ceiling fan (You couldn't see this in the picture). I am looking for a room mate (Preferably females). You can sleep on my bed. You can also use the computer. But please stay away from my guitars and my red underwear. Now coming back to the topic, I also promise to cook food for my new room-mate (females are welcome to apply for this post). The new room-mate will also be taken along with me for all my trekking adventures. I once had a female room-mate and i took her along with me for one of my trek adventures. It was a memorable day. We took lot of photos and we even pitched a tent in the forest. She: Hey Chriz! The tent is big enough. Can I also sleep inside the tent? She left my room without even telling me after we came back from our trekking adventure.This is the picture of me sleeping inside the tent[link]. Care to be my roomie? Man, clean up ur act! (I bet as a species you've been hearin that for ages!!). But, really! As afar as applying for a post, i guess you should consider goin down on ur knees and beggin! LOL! Jokes Apart - Good Luck! "My under-wears are on the floor and one of my socks is on the ceiling fan (You couldn't see this in the picture)." Wonder how you coin stuff like this! Your red underwear seems more famous than your guitar Chriz. You BIG FAT LIAR!! Believe me, Men need NOT be DRUNK while writing this stuff.. It comes naturally to them!! p.s. my boyfriend had similar thoughts roaming around..until I came by.. Now the room's clean, no underwear & socks thrown around!! man..:P...i wish u get the girl fast and let her play ur guitar to :P..
Y u need a room mate? Is not messy enough? your first lesson will be called Girls Fart Too. do i need to send my resume? Actually speaking, I am not even close to finding out the RED underwear in that pic . I did search for it in the pic franctically. Please put up a public display. Thou shalt go to heaven with your Red Underwear. i thought my room was the messiest..
u need room(female) mate for what?? to clean up ur mess?? i can only pray for ur future roommate! i pity her.. atleast she dint kick u in the middle of the forest! so gr8 of her! lolz.. gud luck in finding ur roomie! god, save her! :| :| .... and i thought i was messy! U wanted a female room-mate? i know a very hot female who is looking for a place. she doesn't mind a guy for a roomie!! i almost finalized sending my sister to a boarding school to accommodate her. but apparently they do not take admissions at this time of the year. but you have to move & get a place in Baroda. that is the only glitch. ps: she is hot! did i tell ya that? ewww !! your room is really a MESS !! After seeing ur room, I feel better when I look around my 'cyclone hit' room. About being ur roomie, I'm happy with what I got. Thanks 4 another post which brings smile on my face. 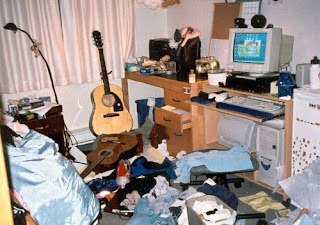 my room is in almost similar condition..
boy i wish i was in India, i wud have come and cleaned ur room for free....i swear, not even a penny!! Hard to find a female roomy haan inspite of u showing soooooo much care n protection!!! I wish ur poor Andrew's condition is improved otherwise he will b left with no roomies at all!!! is there a breathing place in this room?how do u manage to live here..phew!!! by the way...i think u need to increase d incentives a little higher....:Pto get a room mate!!! move ur butts and clean dis room ..u will realise that u dont need any room mate then! u r so obsessed..wit ur red underwear...:D..
then y u need a gal room mate:P..
looks perfectly like my hostel room!! You are the man. Whatae thyaga manapanmai, whatae parandhu virinda manasu. next time u tell me about ur puppy love from school ..ill kick your nuts! but i'd rather leave it for some lucky gal...may God bless her! will you entertain applications on first come first serve basis ?? am i late ?? aaarrghh!! ahahaha!! now i understand wat u meant about ur room in ur comment! now what do we co relate a cluttered room to? well, the author was drunk while typing the post... does it mean that comments too can be typed when drunk?? reply fast coz running out of stocks!!! How do you stay in that room, and you are asking for another roomie, by looking at that mess, I feel only one person can manage to be stuffed in that, and that's Chriz! !